What we are going to introduce this time is ‘Sawarabi’ using Daruma retro. 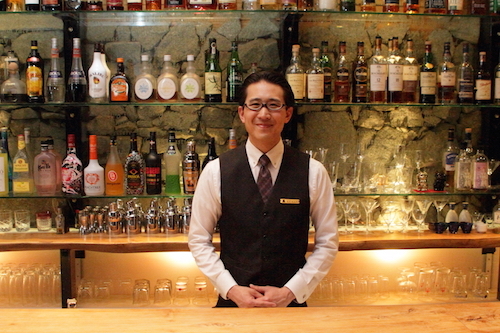 It was invented by Seitaro Fukuoka, the head bartender of BAR enishi. 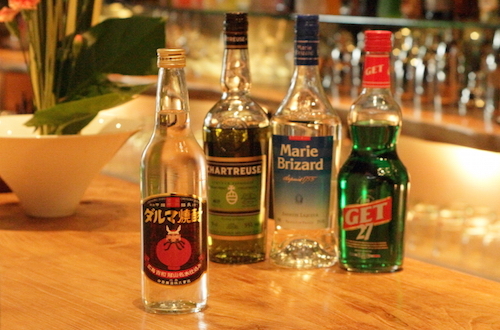 The ingredients are Daruma retro, herbs, star anise, mint liqueur and lime. Put some ice in a mixing glass and mix them around to get the ice corners smoother. Next, add a little bit of three kinds of alcohol. 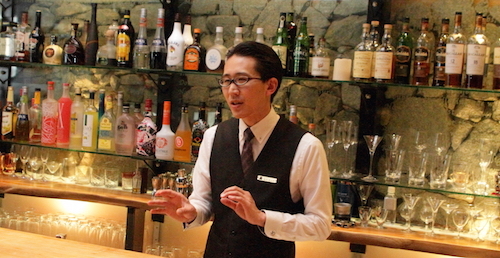 One is Chartreuse from France and a blend of 130 kinds of herbs. Another one is anise liqueur, the liqueur of star anise. The third one is a peppermint liqueur. 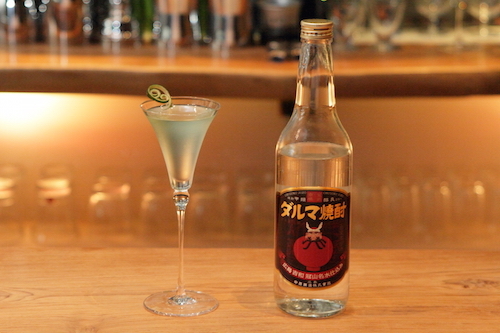 Pour some Daruma retro in at the end, decorate the cocktail with a piece of lime peel to give it an aroma and sprinkle lime peels to complete. Daruma retro is a very clear liqueur so you wouldn’t want to add too many things with it as it may take away the delicious flavour of the liqueur. So, my challenge was to compliment the essence of the liqueur by adding a little bit of sweetness with aroma and bitterness. There’s a green cocktail called Shamrock, this cocktail’s colour is light green and similar to a shamrock. It’s not flashy, but it has an aroma like grass that gives you a feeling of new life and the season changing from the winter to spring, it’s a cocktail for adults.